Cognac Paul Bocuse is part of the H Mounier cognac emporium. Using eaux-de-vie from both Grande and Petite Champagne, the brand was born from a partnership between the cognac house and the celebrated French chef, Paul Bocuse. A champion of nouvelle cuisine, Paul Bocuse is known throughout the world for his innovative gastronomic creations and his part played in providing fine dining for the maiden flight of Concorde in 1969. It seems evident that such a great gourmand would want to adorn a bottle of fine cognac with his own name. Utilizing the might and knowledge of the cognac house of H Mounier, Paul Bocuse partnered with them in 1983 to create the cognac brand bearing his name. Aided by his team of sommeliers, Mr Bocuse took advantage of his keen palate – developed by his years as a top chef – and helped create the cognac blends that were to be sold under the Paul Bocuse brand. At first, these were only offered to patrons of his chain of restaurants, but once the popularity grew, so did the brand and the countries to which it was exported. 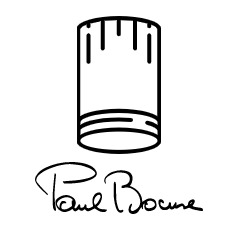 Seen that Paul Bocuse cognac is associated with the H Mounier company and its long-standing cognac tradition, its origins can be traced back to the mid-1800s when Henri Mounier first joined forces with his cellar master and a neighboring vineyard owner to set up his recognized brand name. Cognac Paul Bocuse continues to produce cognacs under the same strict quality control conditions that H Mounier have adhered to for over 160 years. Not only are the cognacs served in Bocuse’s restaurants in and around Lyon in France, but are exported throughout the world. Cognac Paul Bocuse have produced several different blends. All have their own specific characteristics, and tend to have a refined and flowery taste. The blends range from a VS upwards, and include an XO. They are well sought after in various countries around the globe, including Russia and the USA. Reading about Paul Bocuse’s famous recipes, one notices that he uses cognac in quite a lot of them. Needless to say, of course he prefers his own brand. Cognac Paul Bocuse won a gold medal at the 7th Wine World Professional Competition in Russia in 2003. Cognac Paul Bocuse is part of the cognac company H Mounier. There is not any information available about visiting H Mounier. Visit one of Paul Bocuse's famous restaurants in Lyon for the ultimate experience.